The Commissioner for Elections, the first victim of the lack of precision of the 17th amendment. One of the themes that the common opposition made much of during the election campaign was the need to implement the 17th amendment immediately. In fact many of those without a political agenda also see this as a panacea for all ills. Sadly, in requesting the immediate appointment of the Constitutional Council, they do not take at all seriously the reasons given for not appointing it over the last few years. They also ignore the fact that the continuation in office of the Elections Commissioner, which they attribute to the absence of a Constitutional Council, was precipitated by a basic problem with the 17th amendment, which became apparent during the tenure of President Chandrika Kumaratunga. To put it in a nutshell, the Constitutional Council sent her a list of names to be appointed to the Elections Commission set up under the 17th amendment, and she refused to make the appointments. The 17th amendment did not specify what should happen in such a situation, and I believe there could be no satisfactory recourse to the Courts to enforce what is now claimed to be necessary compliance with the law. The reason for this failure is obvious. The 17th amendment was a hasty piece of legislation, which has no basis in any known constitutional principle. It confuses a Westminster style limitation on the appointing powers of the head of government with what usually obtains under Executive Presidencies to limit such powers. In short, when an Executive President is elected, it is his prerogative to make appointments, though it is both understandable and desirable that there should be limitations on what could turn out to be arbitrary appointments. This is done by instituting a process of ratification by another body with due authority, such as for instance the elected Senate in the United States. Conversely, in a Westminster dispensation, the Head of State who appoints does so on the advice of an elected Head of Government, the Prime Minister. In practice the Head of State would not repudiate the elected authority. But in theory this is possible, and since Prime Ministers would not want the Head of State to reject or even question any appointment, they will make sure their nominees are basically suitable. The President has made it clear that, were the required number of nominees to the Constitutional Council sent to him, he would set it up. 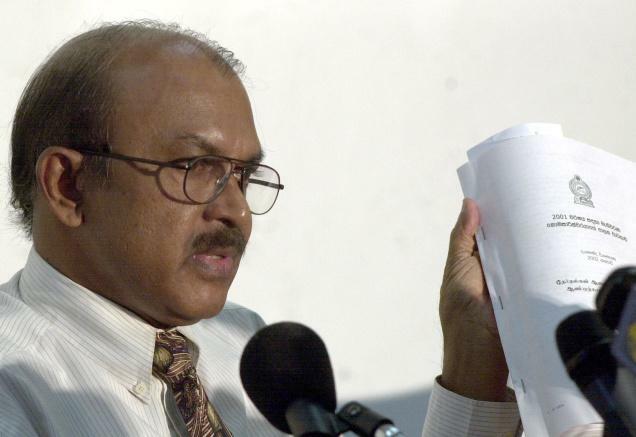 There is no reason for him not to, since he could turn down any of its nominees, given the precedent set by President Kumaratunga in refusing such appointments. But first the minor parties could not agree on a nominee and then, when it was announced that they had done so, it turned out that the candidate they were supposed to have agreed on was under contract to Parliament. Meanwhile Parliament, that had set up a Select Committee to deal with the problem, has failed to finalize a solution. In this context the President has committed himself to a long overdue legislative change that could, in this regard of limiting the absolute authority to make appointments, ensure that Sri Lanka fell in line with established international constitutional practice. I refer to his oft expressed determination to establish a Second Chamber of Parliament, based on representation of Provinces. Not only will this measure serve to strengthen the role of the regions at the Centre, not only will it provide opportunities to review legislation, it will also allow for checks on appointments through a body that has its own authority rather than deriving it vicariously. For this too is a problem with the Constitutional Council as currently prescribed. It consists of individuals whose claim to decide for the President, or in some cases ratify his choices, is based on their being nominated by other individuals. Though those individuals are elected, the parameters within which they operate do not allow for representative choices but rather encourage the development of cabals. And as we have seen, inevitably all the choices are representative of a Colombo elite, perhaps understandable given the concentration of what purports to be intellectual capital in the capital, but in no sense fulfilling the representative requirement of any body that makes decisions on behalf of the nation. A Second Chamber, as envisaged by the President, would ensure that the voice of the Provinces would be heard at the Centre, while also being responsible to the people to provide the checks and balances that any leader needs. Such a body should not usurp his prerogative to decide, but the process of making such decisions will be helped by the awareness that they are subject to ratification. In passing, I should note that the President has, in the other major legislative change he proposes, also dealt with a couple of problems that now adversely affect the body politic. I refer to his determination to change the electoral system, to get rid of the current system of proportional representation that maximizes competitiveness and hence the squandering of resources. That this is a major reason for corruption has been obvious now for a couple of decades, as exemplified by the fate of one universally acknowledged honest Minister in the 2002-2003 cabinet. This was Karunasena Kodituwakku, who had no money to engage in the competition for preferences that so many of his peers relished, and never sought any, and so lost ignominiously. The second reason for reverting to a constituency based system is to ensure that all areas in the country have someone to look after their interests. This will be good for the areas, it will also be good for the MPs who will have much more to do that will translate into concrete action and readily measurable outcomes. This will also help reduce the size of the Cabinet since, while all MPs seek some sort of additional authority, this can be targeted at the development of areas which they know they have to excel in to secure re-election. I should note however that legislation to statutorily reduce the size of the Cabinet would be the best answer to the current problem, a problem that began way back during the Jayewardene regime, when the President did not even have the reason of fearing crossovers. Incidentally, limiting the size of the Cabinet was one of the conditions the JVP made when they gave provisional support to President Kumaratunga in 2001, and I remember asking them why they did not insist then on a Constitutional amendment to this effect. The answer was evasive, leading me to believe that the JVP too has a very pragmatic approach to politics when it comes to real issues of principle. Instead all they got introduced into the Constitution was the hasty and ill thought out 17th amendment, President Kumaratunga not perhaps realizing that this represented the Westminster tradition, to which the JVP is so endearingly committed, and not the ideal of Separation of Power which the American Constitution exemplifies. Meanwhile the President has also made it clear that he appreciates the concerns of parties representing the minorities, who worry about the unrepresentative nature of Parliaments elected solely on the constituency principle. The excessive majorities of 1970 and 1970 must be avoided, and the unpopularity of those governments at the end of their tenure makes it clear that such avoidance is in the interests of government as well as the people. In this regard the President’s assertion that provision must be made for such concerns makes clear his wholistic vision, which will not be led astray by perceptions of immediate advantage that attract some proponents of the first past the post system. The best system for satisfying all requirements is the German system, though I must confess a parochial interest in this, since it was Chanaka Amaratunga who first brought this to national attention. At the time the UNP, which had just seen the success of its pernicious preference vote system in the first Provincial Council elections, accused us of trying to import foreign ideas. But over the years everyone has come round to the need for change, and has based their proposals on the German system, though all these proposals make adjustments that defeat the basic purpose. I can only hope then that those entrusted with the task of constitutional reform in these seminal areas, in which the President’s vision seems so comprehensive, will at least consult Chanaka’s monumental work ‘Ideas for Constitutional Reform’, which came out after extensive consultation of all political groupings in the dark days of the late eighties. All it suggests may not be practicable, but it still remains the only thorough discussion of the issues outlined above, which have so clearly emerged as requiring resolution if the fissures in our body politic are to be repaired.